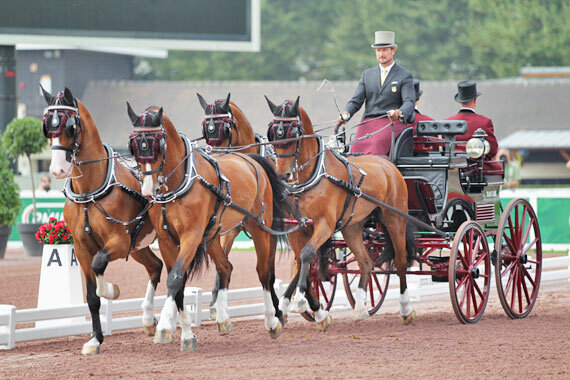 US driver Chester Weber and the Dutch team have made a convincing first step on their way to gold at the Alltech FEI World Equestrian Games 2014 in Normandy. Weber won the dressage competition with a wonderful test scoring 32.21 penalties, 3.3 points ahead of reigning world champion Boyd Exell (AUS) who finished on 35.51. Reigning European champion Theo Timmerman (NED) was third on 37.28 penalties, followed by compatriots IJsbrand Chardon and Koos de Ronde, which puts the Orange team in the lead of the nations competition. About 6000 spectators enjoyed the dressage tests of the 46 competitors representing 17 nations, who performed at the La Prairie racecourse in downtown Caen on Thursday and Friday during the first phase of the combined driving competition. Four-time individual world champion IJsbrand Chardon (NED) was the first starter on the first dressage day on Thursday and, driving his team of KWPN-geldings, became the overnight leader after 23 combinations. Double world champion Boyd Exell drove a solid test on Friday morning, beating Chardon’s score by nearly seven points. Exell’s team of mixed black geldings included the 16-year-old Holsteiner Capone II, whose son Mister is part of Theo Timmerman’s four-in-hand team. Timmerman’s start was somewhat hesitant but improved consistently throughout the test. His right leader horse showed extremely well and secured high notes for his extensions. Theo finished in third place fewer than two penalty points behind Exell. All eyes were on new father Chester Weber whose wife My gave birth to a baby boy Douglas on August 17. Weber, who has gone undefeated with this team of horses the entire season, was very proud and happy. “I am very pleased with my horses, I could not ask for more from them today, they gave their all, they felt like they were dancing on clouds,” the World Number One said. “I had a lot of confidence today. I dared to take a little risk just before my test. We changed the bit on one of the leader horses to make it perform even better and the plan worked well,” Weber said. With Timmerman, Chardon and De Ronde placed third, fourth, and fifth after dressage, the Dutch team is well in the lead of the nations competition on 79.40 points, ahead of the United States and Hungary. With 16,000 spectators expected for the marathon on Saturday at La Prairie racecourse, the competition is sold out. After a 5.080km long A-section followed by a 940m transfer-section, the competitors will enter the B-section covering nine kilometres and eight obstacles. Each will be on the clock for two hours, driving over 16 kilometers in total plus one more in the cool down phase. O-Course Designer Richard Nicoll (USA) is responsible for the design of the eight impressive marathon obstacles, which feature a clock, a farm house, and a well house. When designing the obstacles, Nicoll had two major goals: safety for the horses and the competitors and an attractive sight for the public. “This is why I have chosen not to build long entrances and exits, I want to prevent drivers from galloping out of the obstacles onto the racetrack and into the path of the other competitors,” he said. Nicoll has created a nice variety with more open and more technical obstacles. “I have tried to make the obstacles attractive for the spectators as well. They all include many different route options, so it will be exciting to see which routes the drivers will take,” he said. To protect the footing in certain areas of the racecourse, three of the obstacles had to be built using portable components as inserting elements into the ground was not allowed. Some of the portable parts were therefore made heavier with sand bags to prevent them from moving.